I’m so excited to report that the Churro Rug project is complete. The yarn didn’t take as long to spin as I thought it would. The linen went on the loom like a breeze. Because it was sett so wide apart, there weren’t that many threads. It took about 2-3 hours total to dress the loom. Weaving, well that took a surprising amount of time. 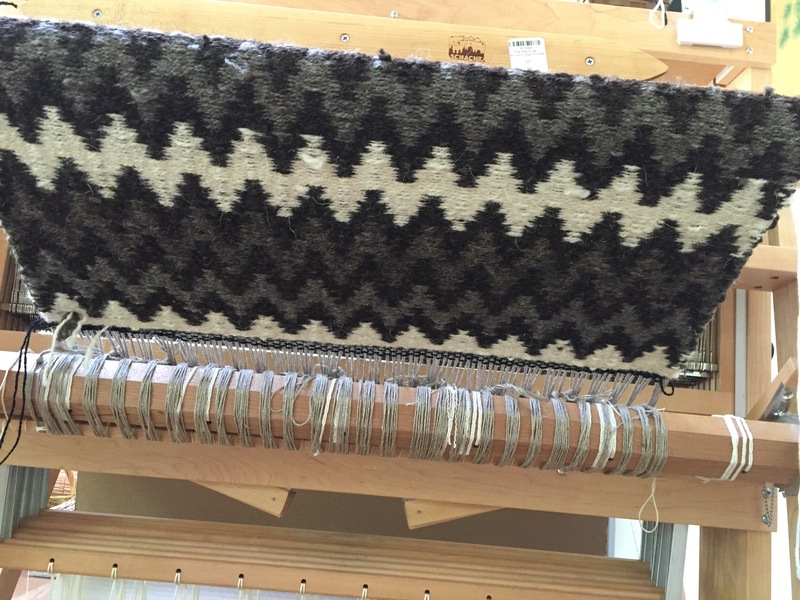 Making a rug that is weft-faced (means that the side-to-side yarn completely covers the up and down) means that you pack the weft yarn down tightly. This meant that I went back and forth a lot of times before even an inch of distance was covered. The result is a solid, dense rug that will lay on the floor and not scoot away easily. The big question for me when I was spinning the yarn was whether I’d get a thick enough yarn to match the commercial one used in the original pattern. I think I got quite close. It might have been a shade smaller, because the 4 repetitions of the pattern came out a few inches short of the projected length, but I’m pretty happy. The other question was whether I’d estimated the right number of yards of yarn for the project. I knew if I needed more, I could spin more, having fiber left over. I had just enough. The final process after the rug was off the loom, was to protect the weft yarn from coming loose. I did a Damascus Edge treatment and then twisted the ends into fringes. I enjoyed the process and would definitely like to make another one (I have enough of each of the fleeces to do that). You can see, the cats approve. 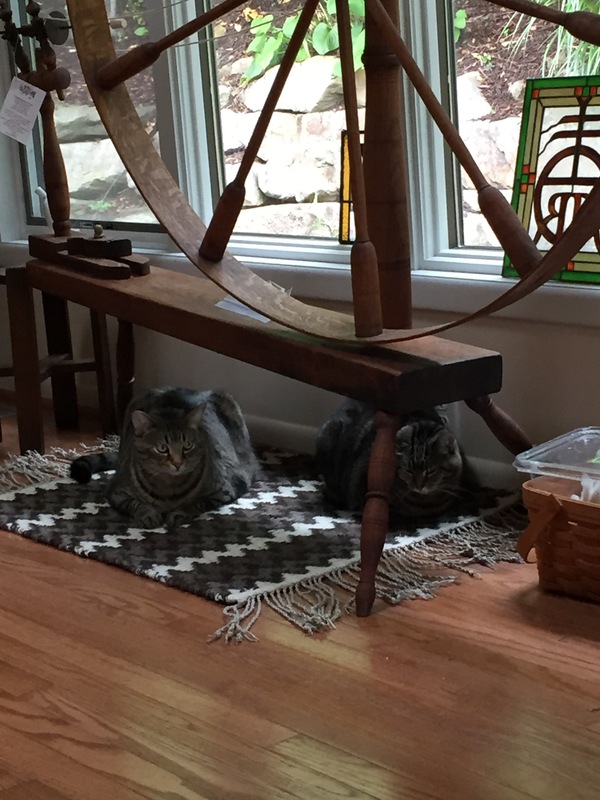 It’s beautiful and the cats look great on their new rug! Thanks. They like it so well, they’re playing with the fringe. I had to temporarily put it away so that when I take it to show people next week, it’s still intact. It looks great under the great wheel. I can hardly wait to see it!